We decided that our Mexican lasagna recipe is destined for posting as our letter L entry in the Blogging from A to Z challenge this month! L is for lasagna--with a Mama's Corner of the World twist! Sometimes I'm in the mood for Mexican. Maybe burritos sound good, but with two little kids, I'm neither in the mood to build the burrito nor clean up the mess. I needed a casserole style dish that I could prepare ahead, serve easily, and clean up without calling in a haz mat team! 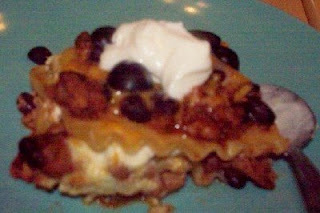 I have looked at other Mexican Lasagna recipes, and we've tried several. Many with tortillas replacing the noodles...some with cheese, some without...some with ground beef, some with chicken. I wasn't really in the mood for any of them, so, as usual, I made up my own thing! This is a little labor intensive, but it is worth it! Prepare the Mexican lasagna filling. Completely blend the cottage cheese and the sour cream in a large mixing bowl. Add in the parmesan cheese and the monterey jack cheese, combine well. Mix in the beaten egg. Assemble the Mexican Lasagna. Preheat oven to 350 F. Begin by spraying a 9x11 or 9x13 baking dish with cooking spray. Add 1 1/2 cups of the sauce to the bottom of the pan and spread evenly. Make a layer of three noodles. Then divide the remaining sauce into thirds and the cheese filling in half. Layer 1/3 of the meat mixture and 1/2 the cheese filling next over the noodle layer. Be sure to spread each layer evenly. Follow with a second layer of noodles, another layer of meat sauce, and the remaining cheese filling. Follow again with a layer of noodles and top with the remaining meat sauce. Bake and serve. Bake the lasagna covered at 350 for 30 minutes. Uncover, top with 1/2 c. shredded monterey jack or cheddar cheese and return to the oven for an additional 10 minutes or until cheese is melted. Let sit for 5-10 minutes before cutting into squares. Top with your favorite taco toppings!